As I did last year I am participating again in the Easter treasure hunt blog hop organised by Jo of Serendipitous Stitching. 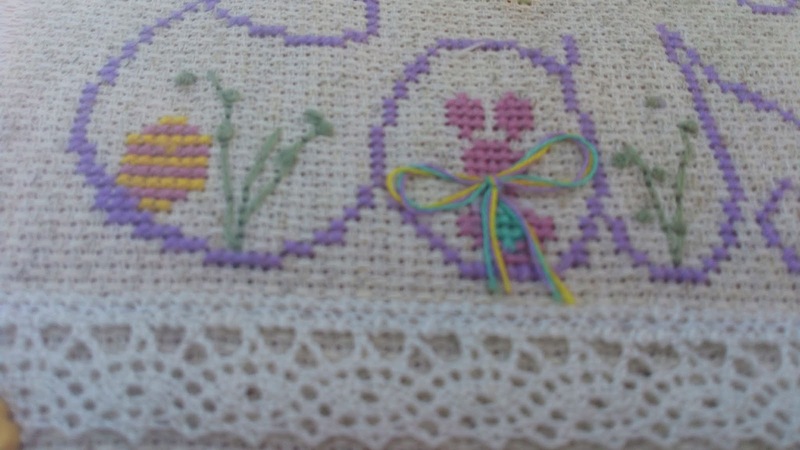 What you do is to hop all around the blogs that take part and see the Easter or Spring stitching they have done. Also you should collect all the letters that each blog gives to find a phrase. Once you have it you should go back to Jo's blog and leave a comment with the phrase.There is until Friday May 3rd. 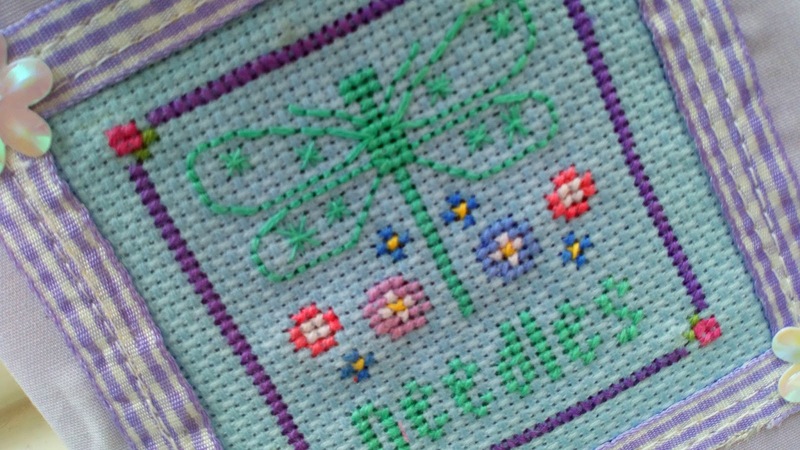 I saw in April’s issue of Just Cross Stitching a embroidery tray design. Obviously I am not going to do any tray but I thought the design was nice for framing. It is a design from Anna Chinotto of La Bottega delle Meraviglie di Anna. I stitched it in Aida Rustic Oatmeal 18 count and used most of the call for threads, I substituted some of them. 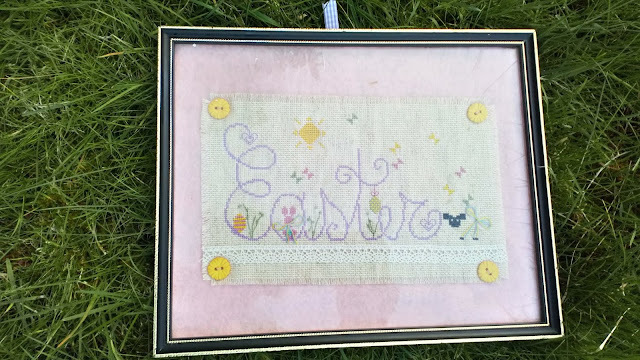 I framed it over a baby pink felt and I made the borders thread finged. 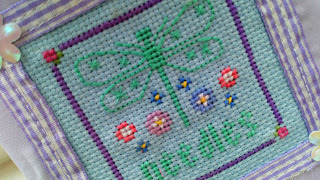 I want to end this post showing a close up detail in that embroidery, the french knots. I have been trying to make them for years and only now I can only say that……. I KNOW HOW TO DO IT!!!!!!!!!! I am extremely excited and happy, I thought I could never do them. And the next blog you should go to get the phrase is Le Coeur Celtique. I didn't know that blog but I got surprised with it, not only for the content but also because it looks like mine. 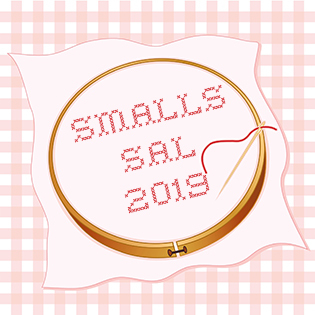 The Let People Choose SAL is hosted by Serendipitous Stitching. 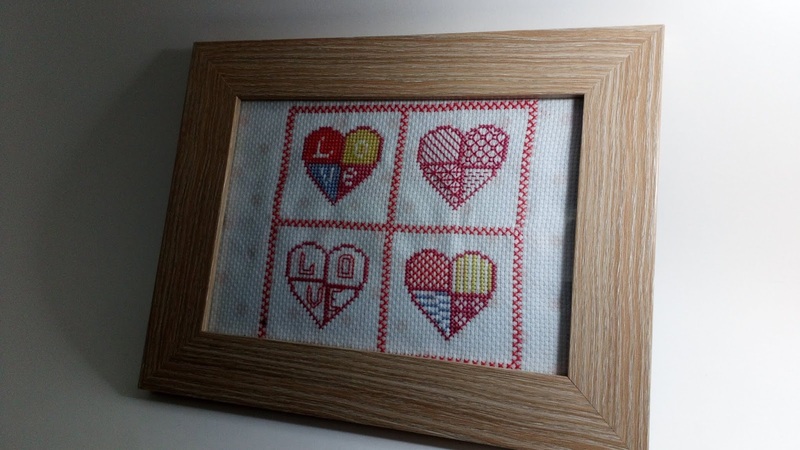 Time again for Let People Choose SAL, organised by Jo from Serendipitous Stitching each month. 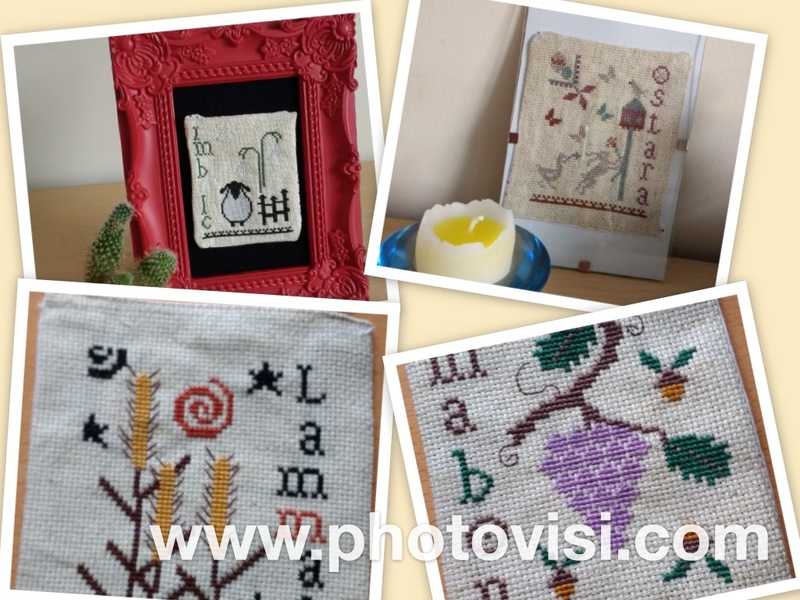 Every month there is a theme proposed, what makes even more funny participate as you not only stitch but also look for the pattern you want to stitch. 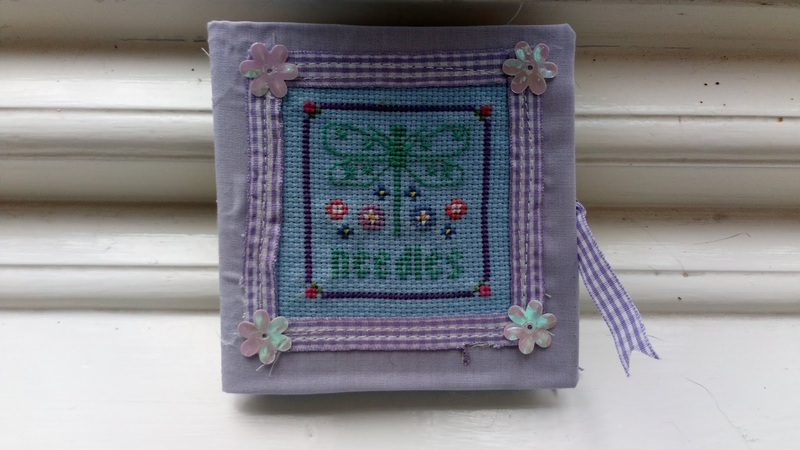 This month Theme is Speciality Stitches. I think I was quite lucky when I decided to buy April’s issue of the magazine Just Cross Stitch. As it is the Easter special issue they proposed some Easter designs. I quickly fell in love with one of the designs as it was Ummm……...beautiful? ……….. I can’t really find a word to describe it. 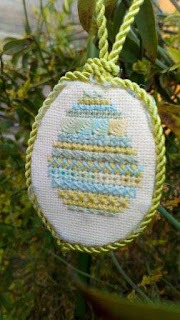 It is an Easter egg make using only special stitches and they proposed different options: green, blue and pink. Ok, I would like to make all or even more colours, but for the first one I chose green. 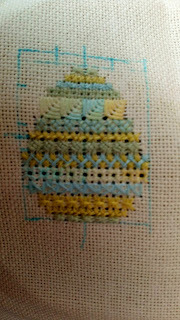 I used 28 count Lugana fabric in cream and the call for DMC threads for the green egg. The egg is designed by Charlotte Smyth of Charlotte's Web Needlework and it is called A Stitcher's Egg. I finished it in the obvious egg shape, using cream back fabric and cardboard to make the whole harder and I put green cord all around which not only help me to hang somewhere but also is very decorative and hide the two part join edges. Let’s see if I can make the other colours before Easter. As I mentioned in the presentation post for that SAL I wrote in January I have three projects from 2018 I would like to finish in 2019 and this SAL is a good opportunity for that. This time I decided to finish one of the parts of my project Sabbats from The Primitive Hare. I started this project in 2017, continued with it in 2018 and I hope to finish it in 2019. I finished Lammas and Mabon in 2017 and Imbolc and Ostara in 2018. 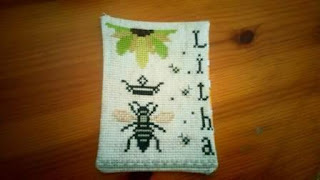 Now it was the turn of Litha. As with the previous Sabbats I stitched it in 18 count Aida rustic Oatmeal. This time I used a deep yellow fabric printed with flowers for the back. I am a bit late but I wanted to present something in the SAL Let People Choose. 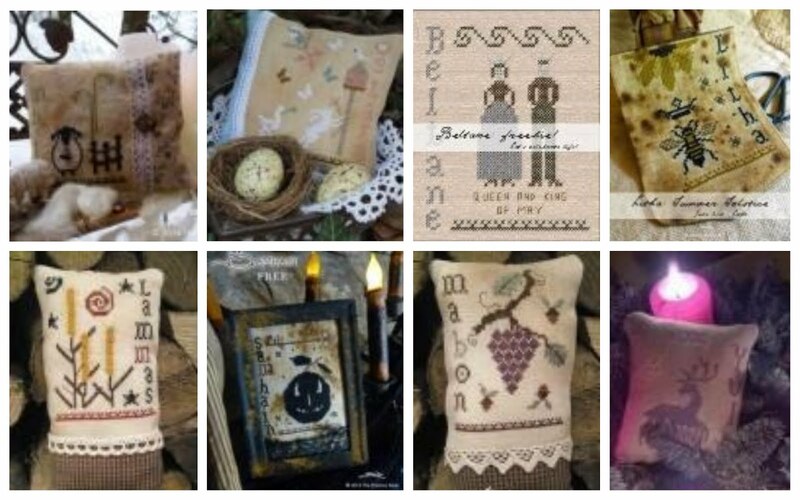 In this SAL organised by Jo from Serendipitous Stitching each month there is a theme proposed. This month Theme is Freebies. It look easy to choose a design as the quantity of websites offering freebies is huge. But that can be also a problem as I like all the designs I see. It is never easy for me to choose a design, but finally I did choose one. 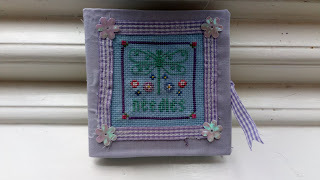 For quite some time I wanted to make a needle-book as most of my needles are here and there and I never find them. 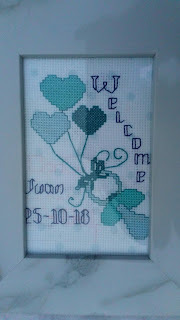 I chose a freebie published in the website Cross Stitch Happy. 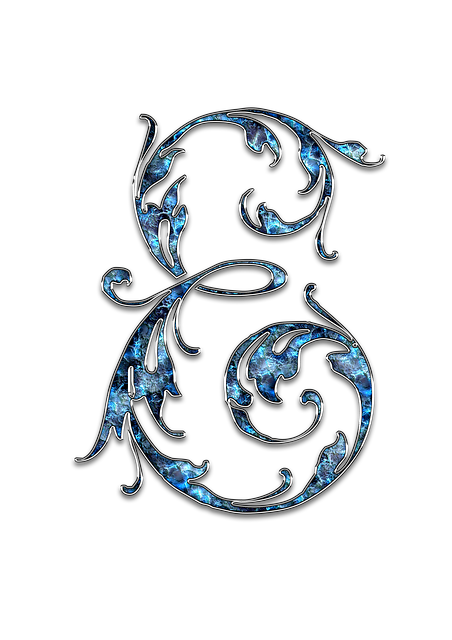 The design is a dragonfly with the word Needle underneath. I made it in 18 count Aida in color baby blue. I mounted using lilac fabric and inside and for holding the needles I used baby blue felt. I used some white and lilac ribbon around the cross stitched piece and for closing the needle-book. 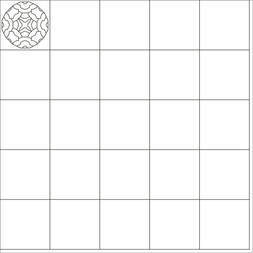 The corners are decorated with four flowers. Last year I participated for the first time in the WIPocalypse 2018 SAL organized by Measi’s Musings and I enjoyed too much. This year I didn't want to miss the opportunity of repeating the experience. 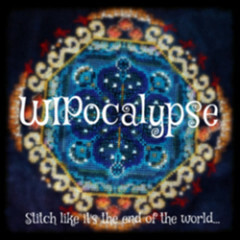 I wanted really to publish in the previous WIPocalypse update in January, but as always in my busy life, one thing brought to other and finally I couldn’t write or even finished the projects I wanted. That normally happens to me all the years, I take a while taking the new habits you want to implant for the new year. But now all is being settled, I am being able to do most of the thing I want (unfortunately not all) and I am ready to join the WIPocalypse 2019. I have finished other small projects which are not part of any SAL and they are punctual jobs. As that is the first post I am presenting here this year, I am going to introduce you to all the projects I mentioned. 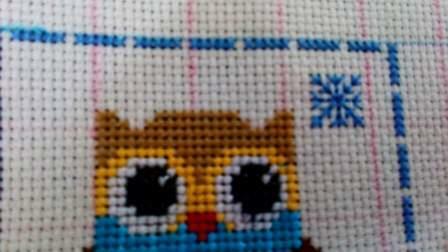 Hooties All Year Round is a PinoyStitch design. Last year I made his design Hooties 12 Days of Christmas and I liked it so I bought in Etsy that new design. 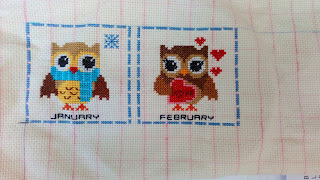 That one has one owl each month with something representing the corresponding month, as for example in the two I am showing here, a scarf and red beak for January and hearts around for February. 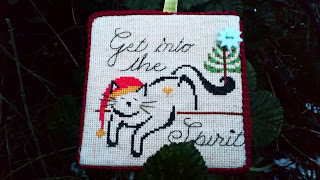 I am stitching it in white 18 count Aida fabric but I chose this time the Magic Guide one because I wanted to see how it is going. 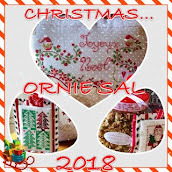 Just Cross Stitch Christmas Ornaments are part of the Christmas Ornie SAL 2019 organized by Christmas Ornie SAL 2019. Last year I participated with the mentioned Hooties 12 Days of Christmas. 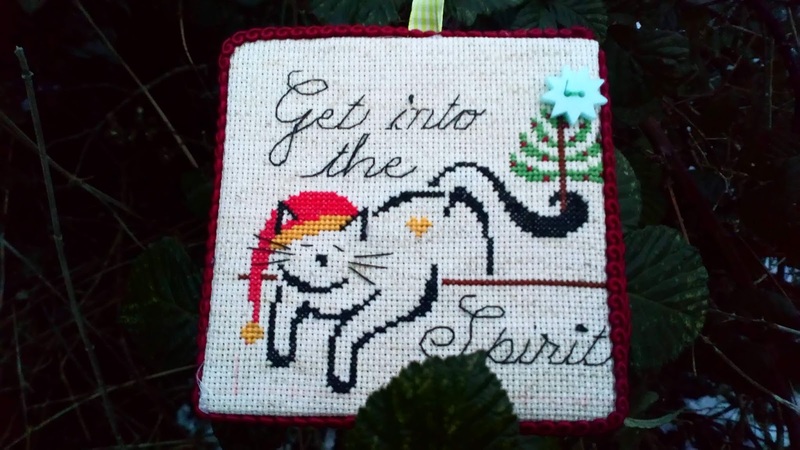 This year three options were proposed, 12 Days of Christmas, Christmas Carol or Just Cross Stitch magazine. I have most of the issues of that magazine so I decided to go for that option. Each month I will choose one design from the issue specified and at the end of the year I should have 12 ornaments if all is going right. 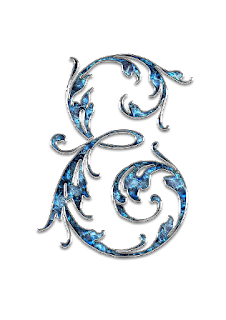 The first one is a design made which was published in the special Christmas issue published in 2009. I did in Aida 18 count rustic Oatmeal with threads in similar colours of the ones in the example. I finished it in a pinkeep style. 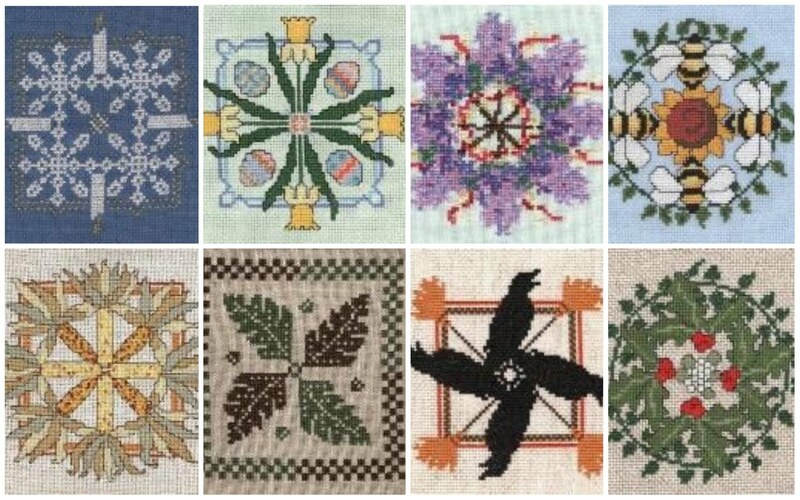 One Flower each month is a project proposed in the magazine Cross Stitcher. Each issue will be having a flower representative of that month. I did January’s one, the snowdrop. I chose for my snowdrops a brown 28ct evenweave and stitches 2 strand over 2 threads. I used the threads DMC in the called for colours excepting for the white one. I decided to substitute this thread for the new variety of DMC thread, the DMC Etoile. I finished it as it was proposed in the magazine, as a heart shape cushion. 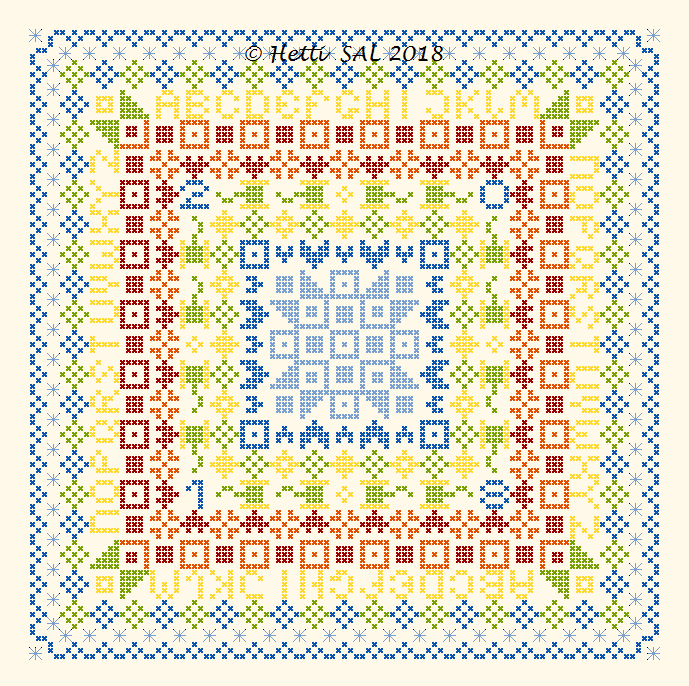 Connie Gee Design Blackwork SAL is one of the projects carried over from 2018. Last year the 12 first parts were released and I was nearly on time. The design comprises 25 parts so it will be going over all 2019 year. I didn't have time to work on that project and it is as I left in 2018. Las year I wanted to make an Advent Calendar and actually I started it. I did the two first days, a star and a gingerbread man. I chose a nice 18 count Christmas red fabric and the colours for threads (excepting some red shades which are not going to be very visible over that fabric). I am carrying over this year and I finished the third and fourth days, a pair of mittens and a bauble. I need to speed up a bit. I finished also two small jobs, both for a present, and now they are in their new homes. One of them is for someone very special for me, my cousin and friend, who has a baby boy last October. I wanted to do something special for him and I made a birth record. I chose a design consisting in dummy with some heart shaped balloons. 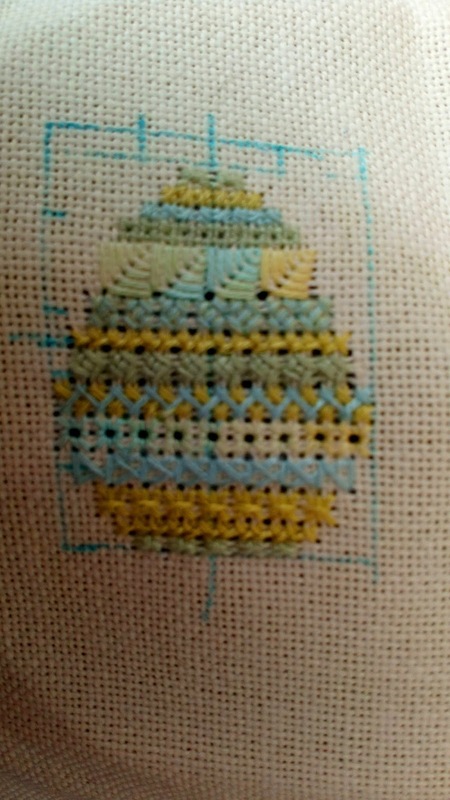 It is done in 14 count Aida white with baby blue spots and the colours chosen for the design are also blue shades. I framed it in a fake marble frame. 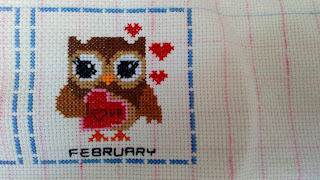 The other small job was made for a Valentine's Day swap organized by my Spanish cross stitch group. 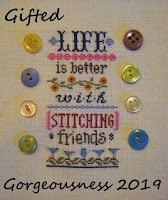 I stitched a freebie designed by Agi from the blog The World According to Agi. Obviously the design is based on hearts. 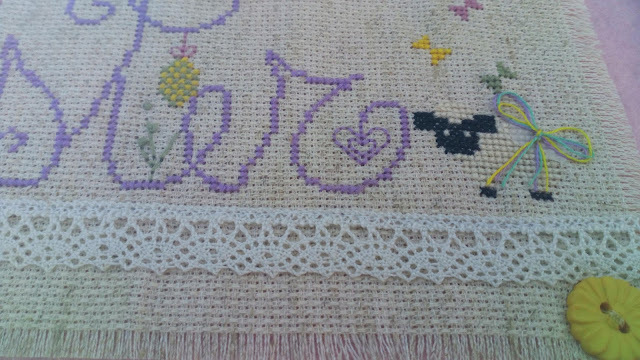 I made it in 14 count Aida white with pink spots. I started also my Seasonal Dreamcatchers, but I will talk about them next month after advancing a bit. This is the second year I join that SAL. I discovered it last year, when it was hosted by Stitching Lotus and I enjoyed with the monthly updates. 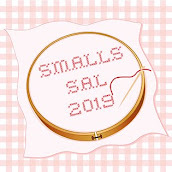 This year I went to Stitching Lotus to join and I knew that the SAL has a new home....... Now it is living in Mary's Thread blog. Thank you for giving a home to this SAL. So many times we are very concern in working in big project taking us ages to finish them (I made two projects which took me around 2 years each) and we pay less attention to small things which most of the time you can quickly do and gives an excellent result, mainly for seasonal decoration. This SAL encourage you to do this type of small projects. 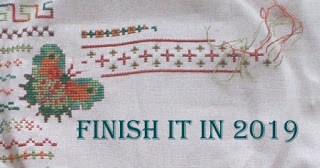 I am subscribe to Cross Stitcher magazine from years. They normally propose a SAL or serie of pattern to make along the year. This year they proposed a SAL which I didn’t like too much. But they proposed also a collection of flowers. The idea is to make one flower every month which is going to be the most typical flower for that month. Obviously you can finish it off as you want, but I like the way they are proposing in the magazine and I think I am going to follow. There is also a small description and picture of the flower of the month. January’s flower is ………. Snowdrops. 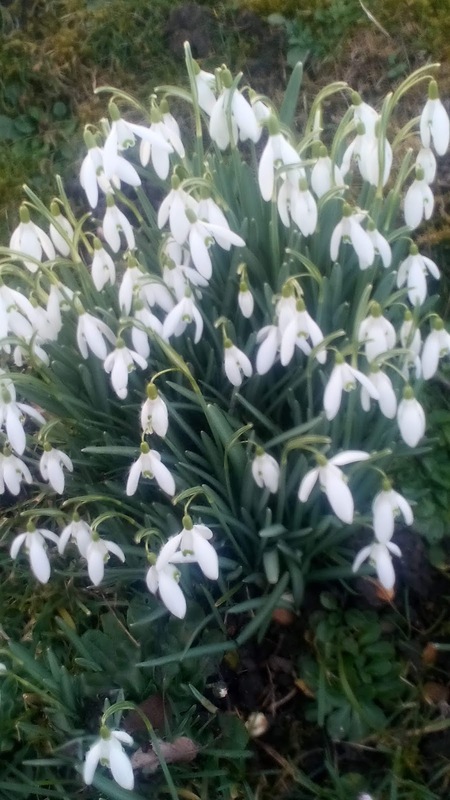 I love snowdrops. When I see them for the first time in January, many times coming out through the snow, my mood changes. Obviously it is winter and most of the times there is still quite long time of cold weather, but they are the signal for the beginning of the spring which will be confirmed when the daffodils sprouts. For that design there are couple of things I tried for the first time. 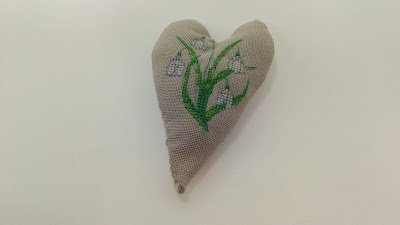 I chose for my snowdrops a brown 28ct evenweave and stitches 2 strand over 2 threads. I have never used this fabric before but I think I am going to use it so much more from now as I like how the cross stitch looks and I like how I can stitch on it. I used the threads DMC in the called for colours excepting for the white one. I decided to substitute this thread for the new variety of DMC thread, the DMC Etoile. I bought few threads of this variety last year just after they were released but I never had the opportunity to use them. I decided to do now and even if the results are not amazing, I can say they are not bad. I think I need to try in other type and colour of fabric as well as other thread colour from the same collection and write a review about them. You can tell me in the comments if you are interested……. I finished it as it was proposed in the magazine, as a heart shape cushion. I chose a beige fabric for the back and I think it is not too bad, don’t you think? 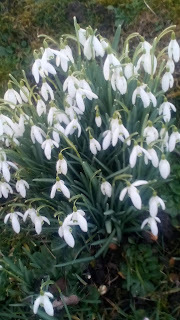 It looks nice, but not as the real snowdrops. The Gifted Gorgeousness SAL is hosted by Serendipitous Stitching. As most of you know, I like stitching owls. The responsible of that is my mum, who is an owl collector with more than 250 owls in all the shapes, positions and format (figurine, magnet, soft toy, embroidery,...). I got as a Christmas present the chart designed by Pinoy Stitch called “Hooties All Year Round Mini Collection #1”. The chart consists in an owl representing each month of the year. For that reason each owl is “wearing” something characteristic of the month he represents. 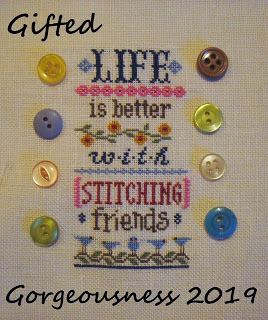 Because I got the chart as a present I decided to participate with it in the link party organized by Jo in Serendipitous Stitching called Gifted Gorgeousness 2019. To participate on that the condition is that what you present in the post must be related to a gift, a gift you received or a gift you are doing for someone else. For this project I chose a 18 count white Aida fabric with magical guides. 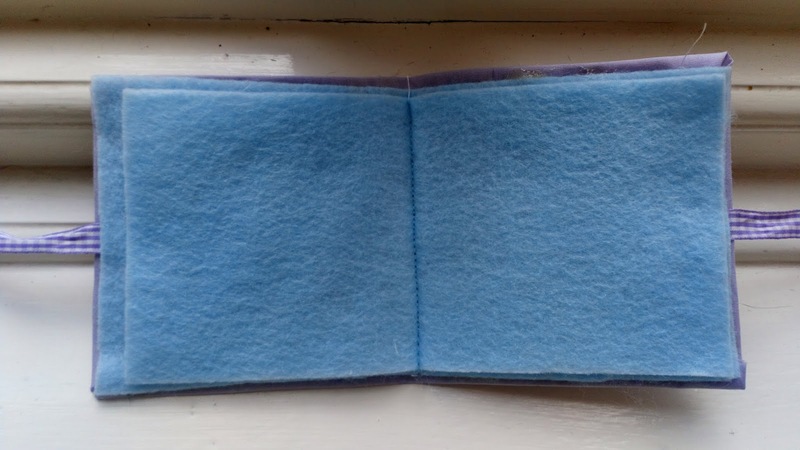 It is the first time I use this type of fabric; I will review it after using it and eliminate the guides. Threads are the called for one, DMC brand. 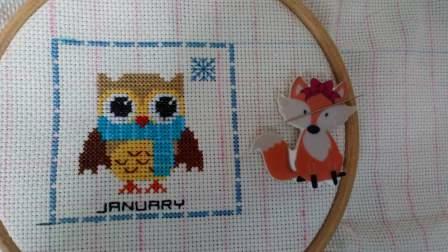 I finished the January owl, who is wearing a scarf as corresponds to the cold winter we are going through. I just realized that this owl has the beak red, as a consequence of the cold, I guess. 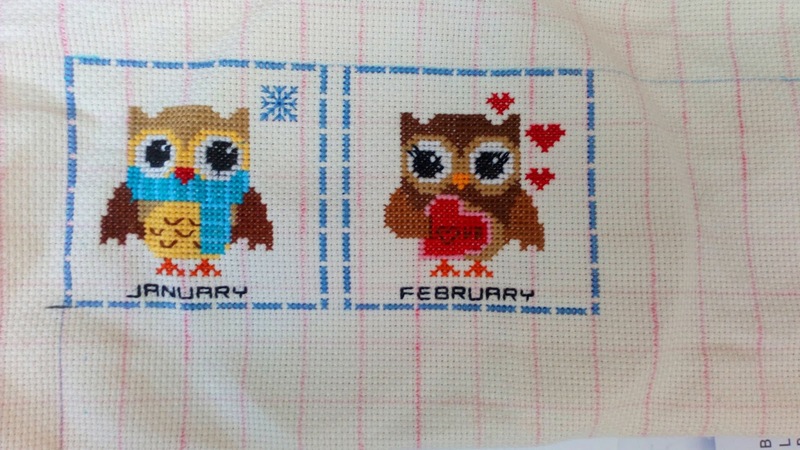 I wanted to catch up with this chart and I pressed myself to finish February’s owl before the end of the month. 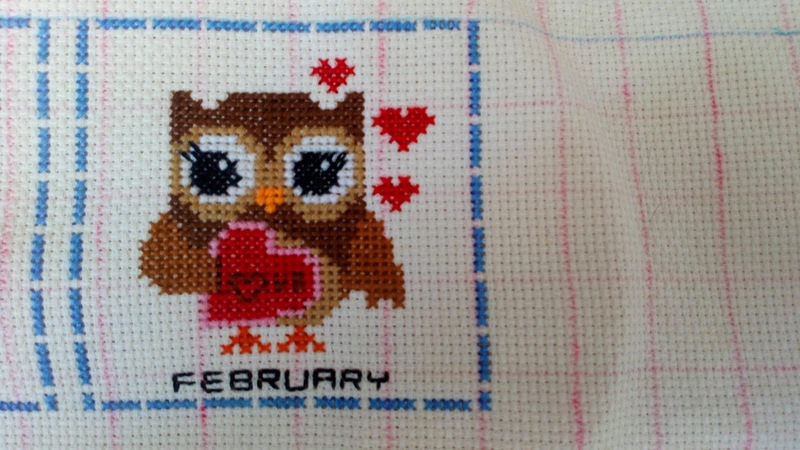 As cannot be other way, February owl is an owl in love. I should say it is a female owl because of the long lashes she has and she is carrying a heart as well as she has many hearts around. I am looking forward for March owl.